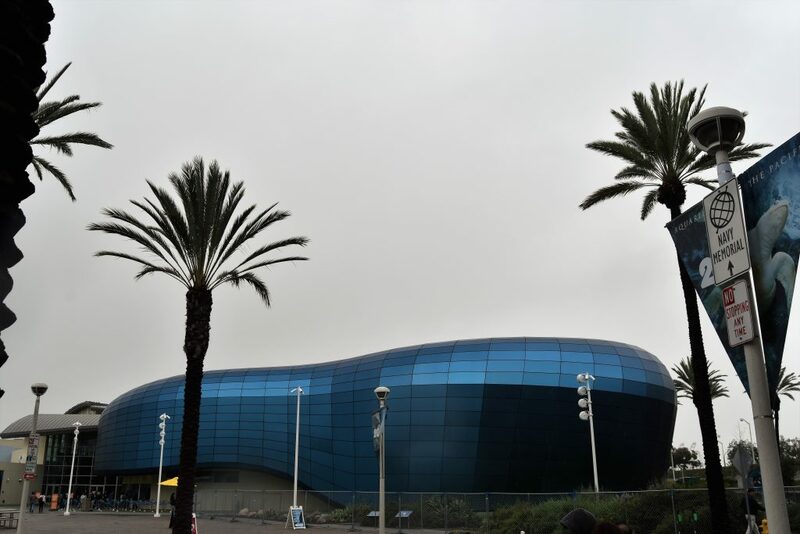 The Aquarium of the Pacific in Long Beach, California is a must-visit location in SoCal! We spent some quality family time learning and discovering on a rainy Sunday. 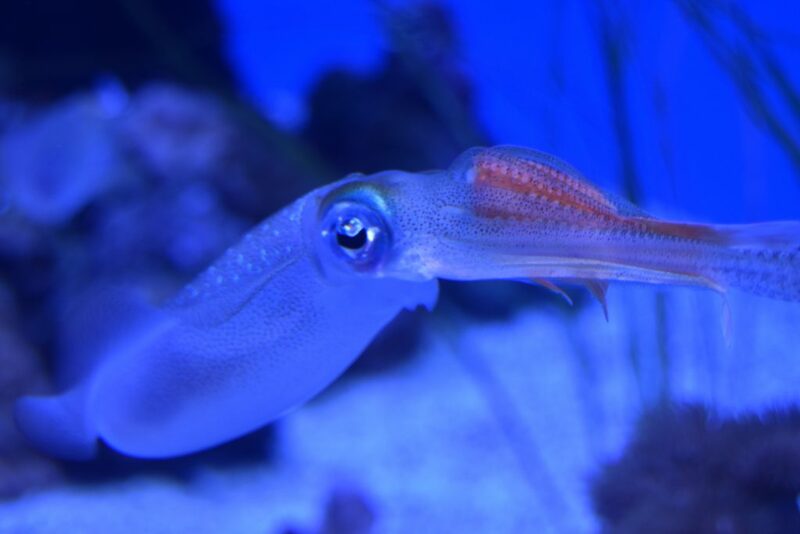 Read on for 4 reasons to visit the Aquarium of the Pacific! I received complimentary media tickets in exchange for my post about the experience. However, all opinions are my own and reflect my thoughts about visiting the Aquarium. This post contains affiliate links. A SoCal Way of Life receives a commission on all qualifying purchases. 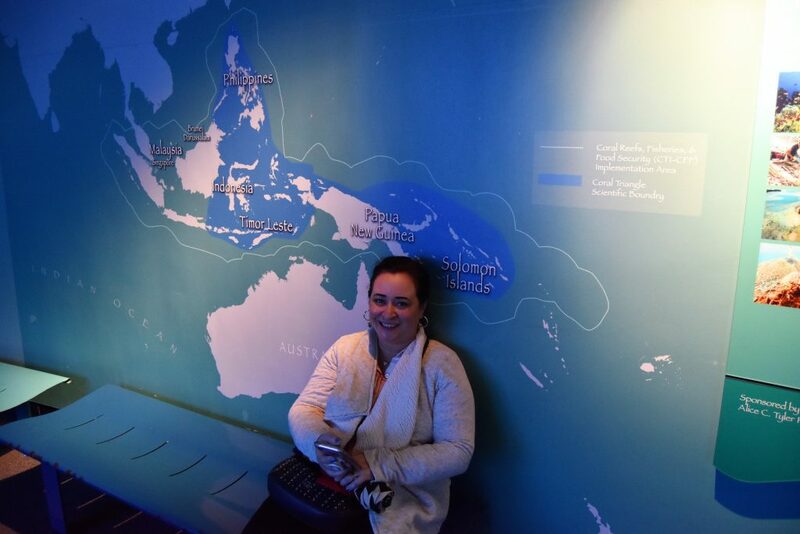 The Aquarium of the Pacific holds a special place in my heart. I was a member for several years when my kids were younger. We would visit at least a couple of times a month to get out of the house and learn about the ocean. I recently had the opportunity to visit again and found that the magic remains! Every single person in the family was having a great time. 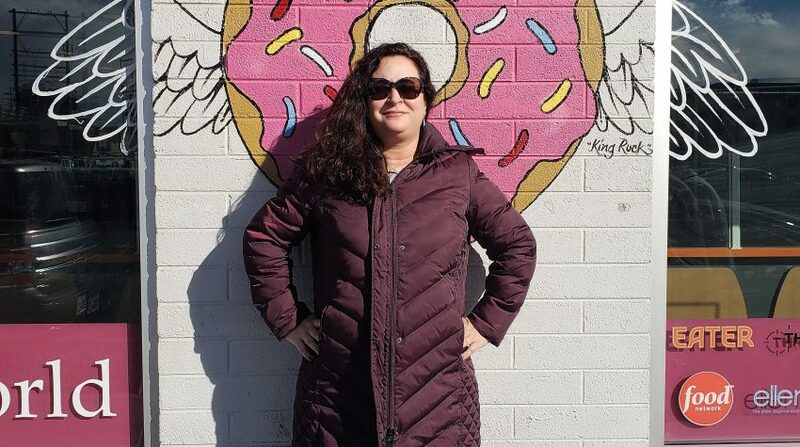 I originally feared that my kids would have outgrown the experience. Not the case! We were immediately shocked to find that the exterior of the Aquarium of the Pacific building now looks like a whale! Giant whale at entrance of the Aquarium of the Pacific. 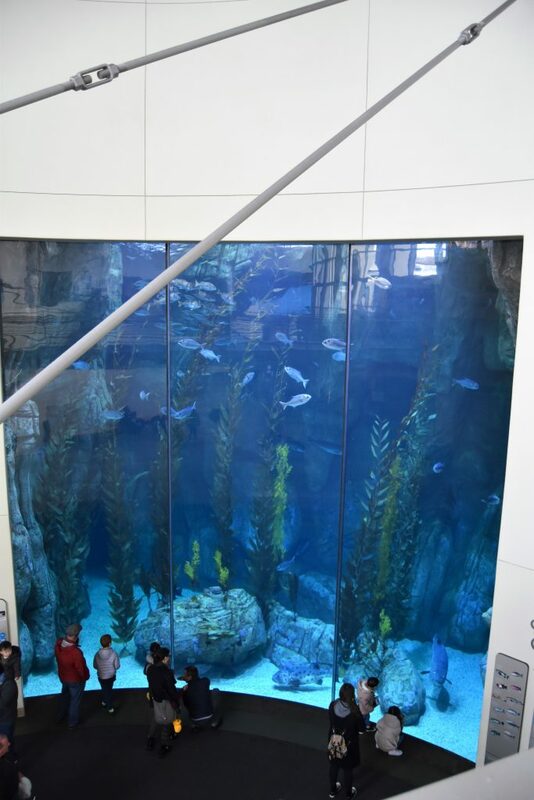 There is a floor to ceiling window in the aquarium where you will find presentations at various time slots. Floor to ceiling aquarium at the entrance. It’s pretty difficult not to be mesmerized by the ocean creatures, and by the shear amount of living things in the sea. I think it’s important that people (especially kids!) 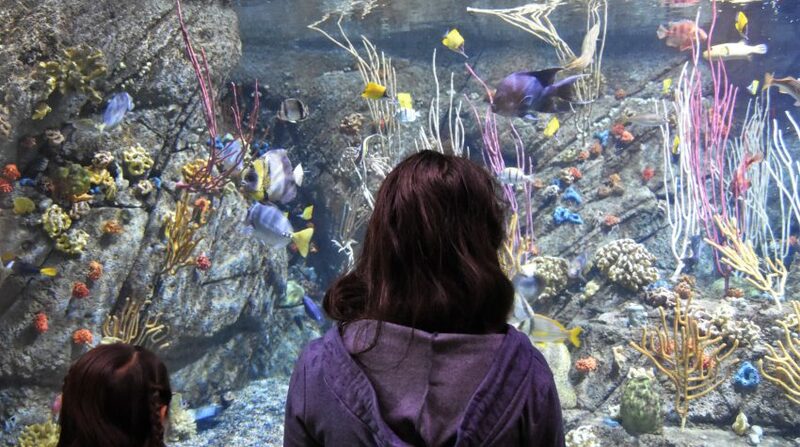 get to interact with the ocean animals at The Aquarium of the Pacific. 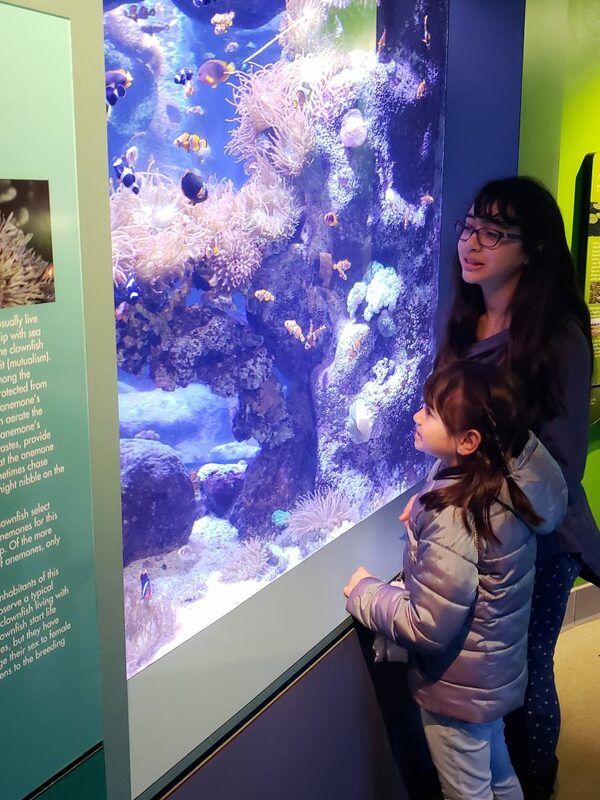 When kids connect with the animals at the aquarium, they learn why it’s important to be friendly to the environment. 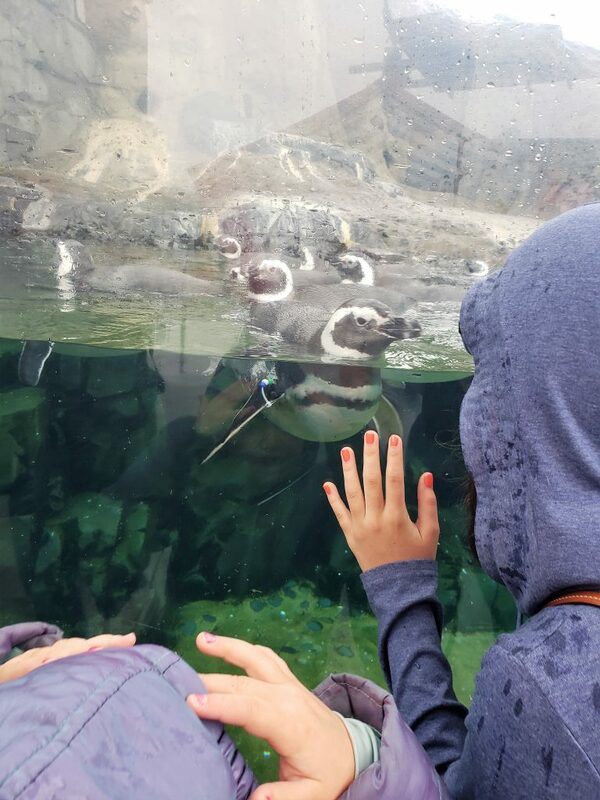 Once you meet an adorable sea lion or make eye contact with a penguin and feel a connection, you can’t help but want to protect them. 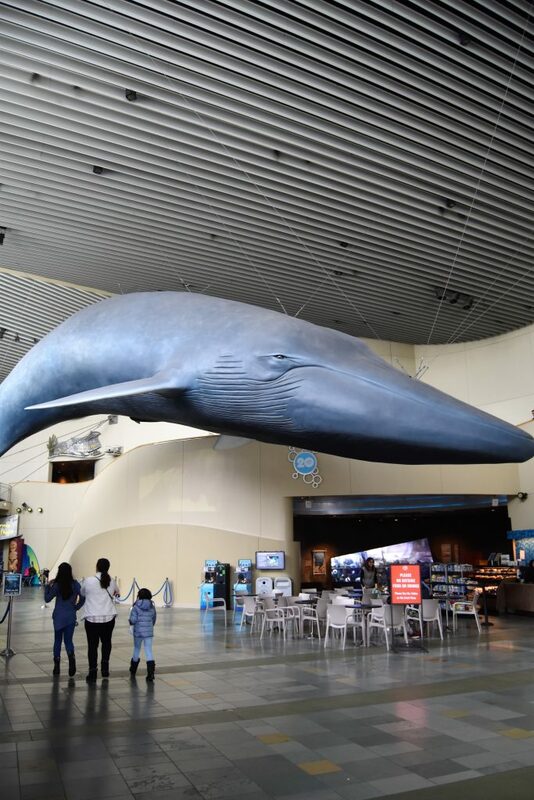 Suddenly, aquarium visitors don’t mind using reusable bags and straws instead of disposable. Have the kids watch a movie like Aquaman or Finding Dory after their visit. That will make the message sink in that much more! 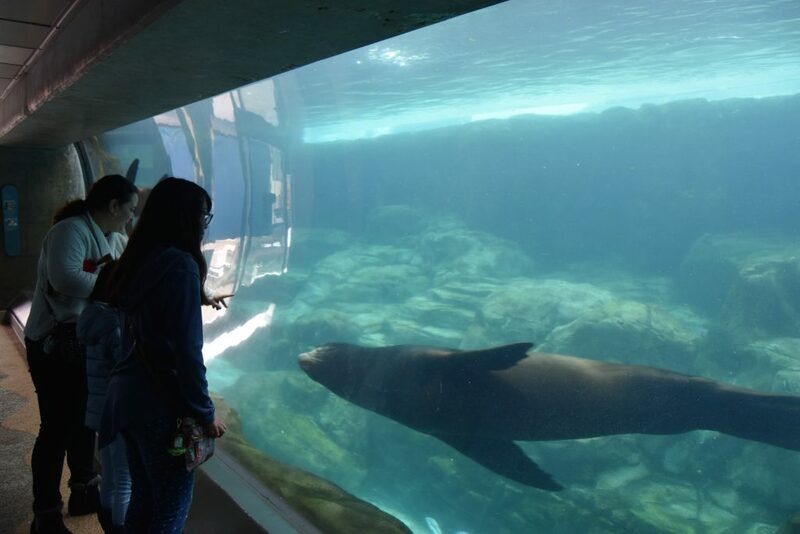 The sea lions are one of our favorites. They glide through the water enclosure and are playful with the kids. Sometimes they swim right up to them. 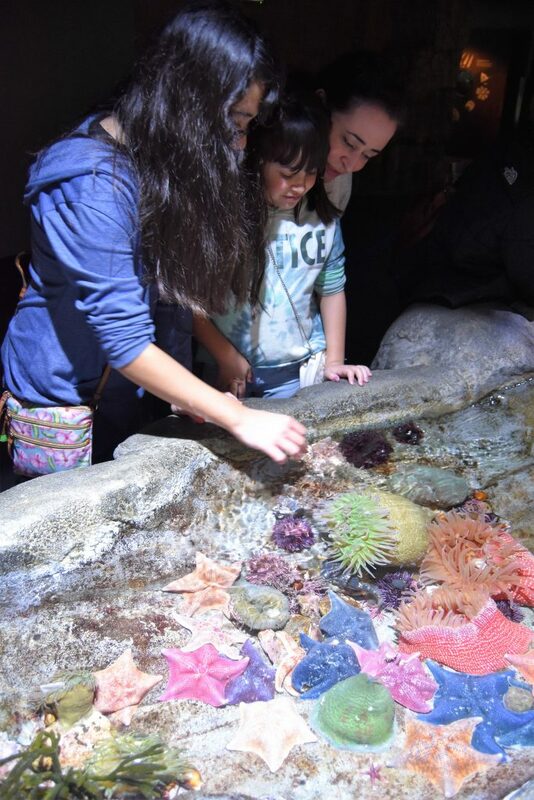 Kids and adults alike get to actually touch different sea life at The Aquarium of the Pacific’s touch tanks. 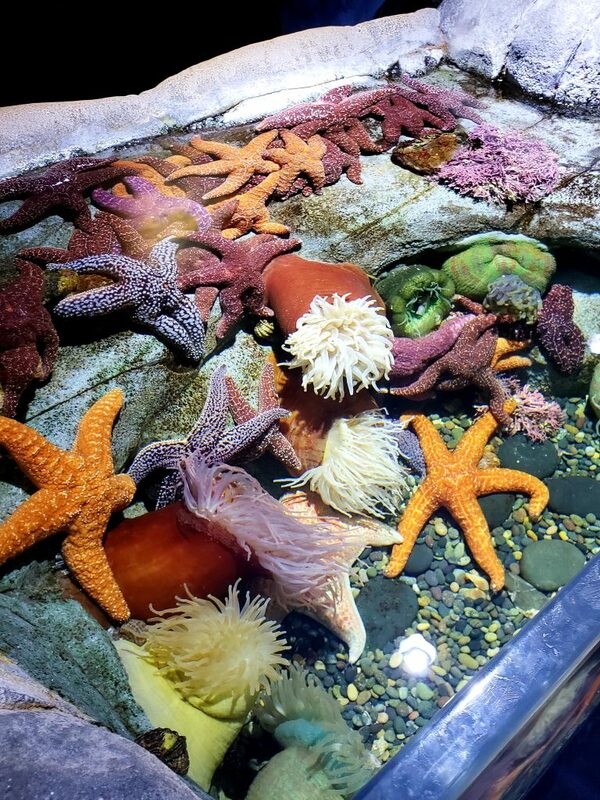 You can touch starfish, sea urchins, and anemone at this touch tank. 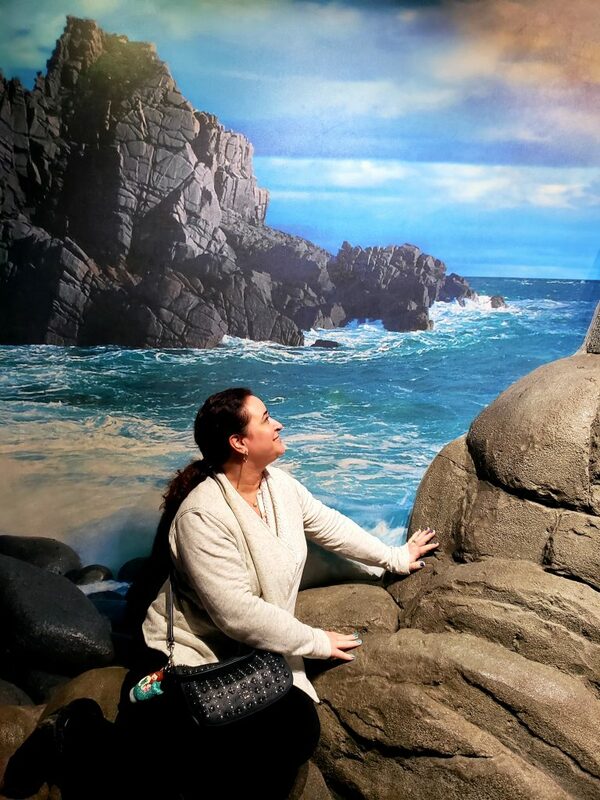 Some people will be more willing than others to touch sea animals. Which will YOU be? 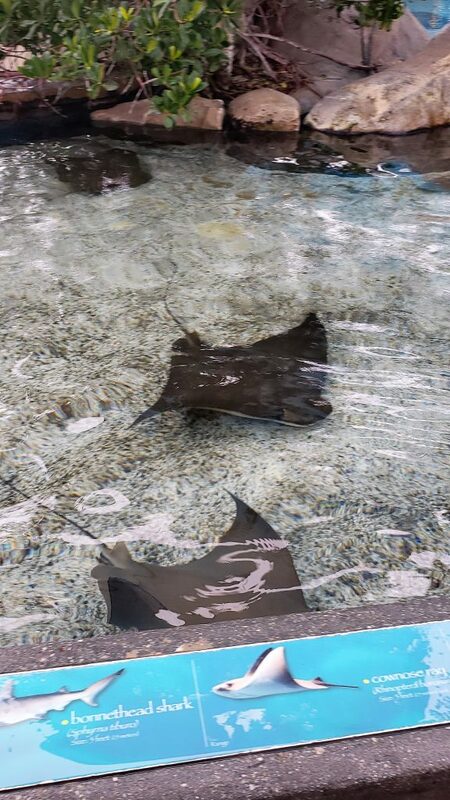 Believe it or not, there is even a touch tank where you can touch stingrays and sharks! This is one of those outings that you can feel good about! 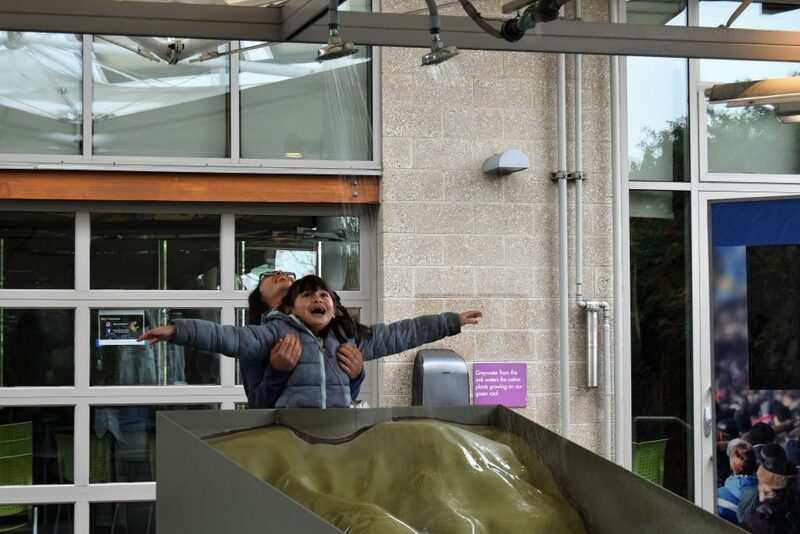 The kids are having fun while learning all about the ocean. Major Mom of the Year points! 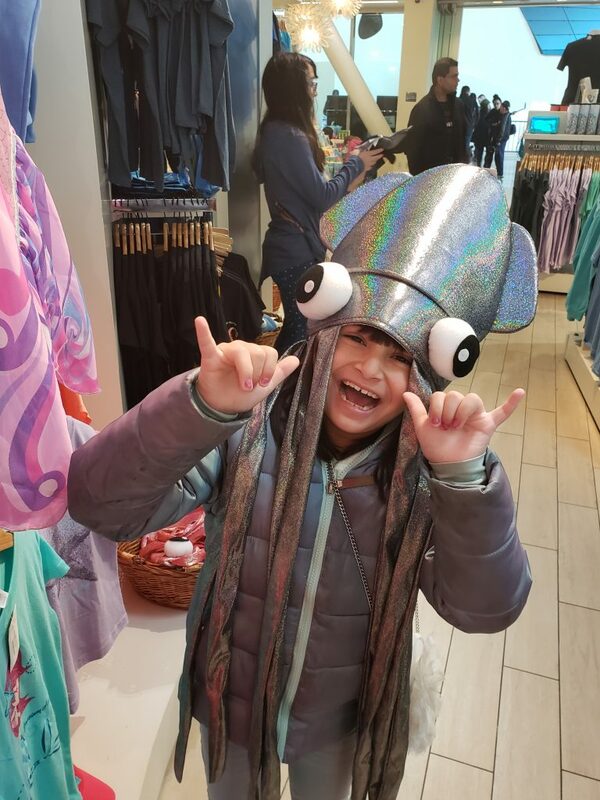 One of my youngest daughter’s first words was “Octopus” because she was so amazed by this beautiful sea creature. 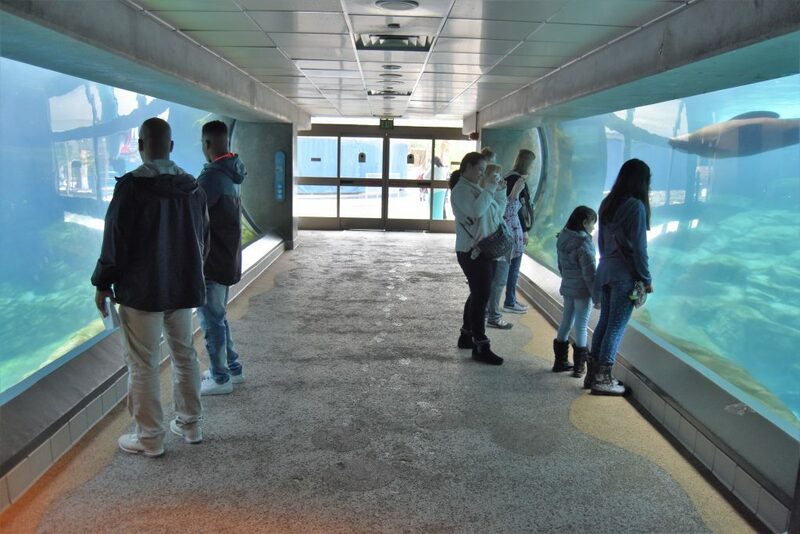 There are plenty of interactive exhibits throughout the aquarium. 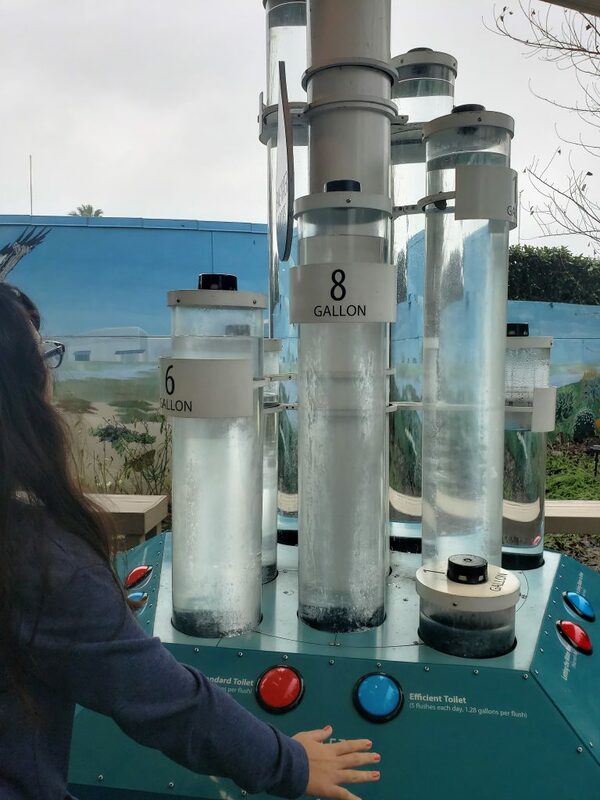 New to us was the exhibit that teaches you all about water and how to conserve. We learned about watersheds, and things like how much water you save when you turn off the water when brushing your teeth. It was eye-opening for the kids AND adults. It also helped the kids understand why we tell them to turn off the sink! 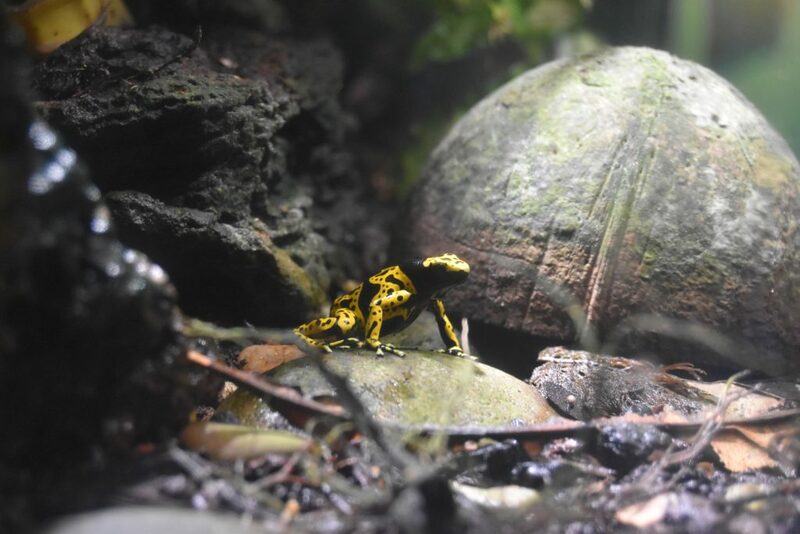 The girls were amazed to find out that there are so many different types of frogs, some even poisonous! 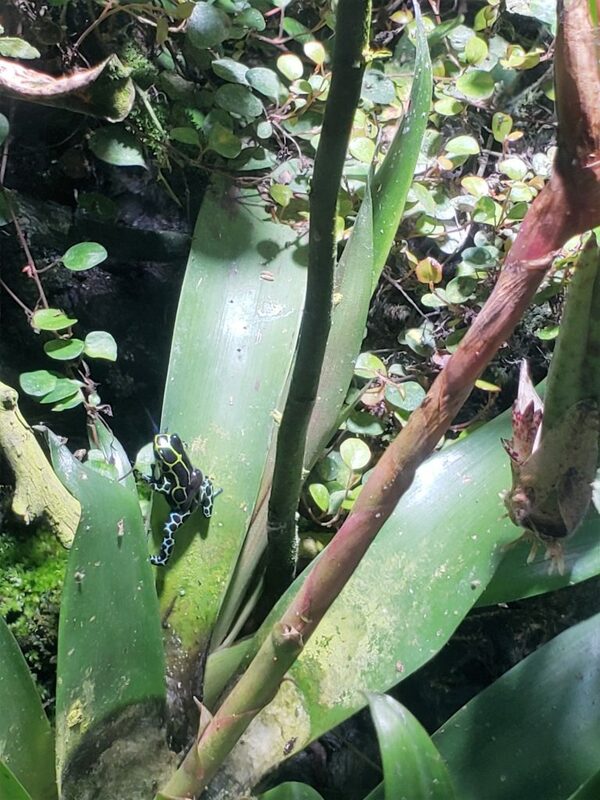 I think this frog’s stance is hilarious. 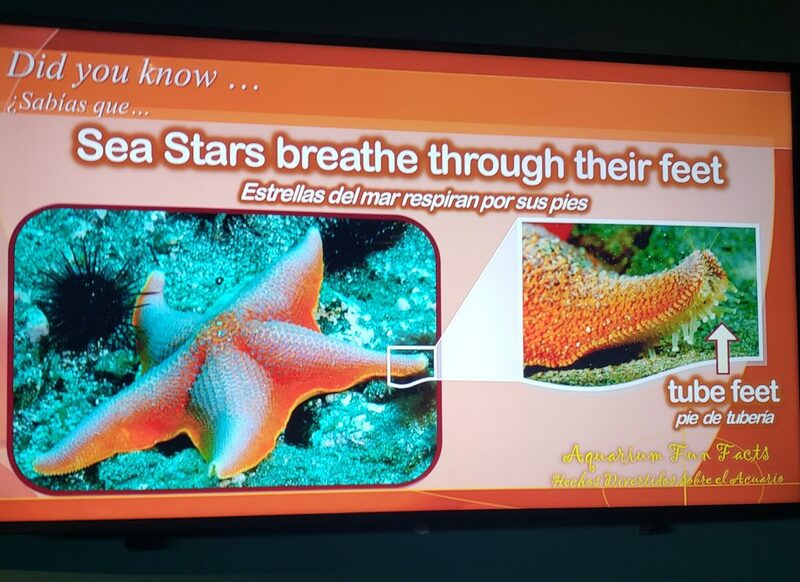 One of the reasons that I loved taking the kids to the Aquarium of the Pacific so often when they were little? It is one of the most mom-friendly places you will find to take little ones! I generally came on weekdays by myself, with two kids under 5 years old. There’s a play area for the kids to burn off some energy. 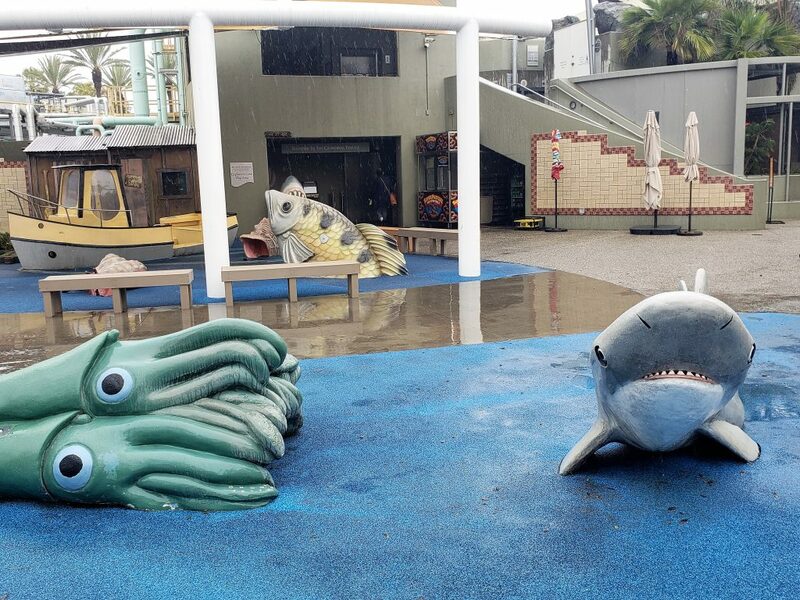 It was a rainy day, but the kids still wanted to check out the playground! The bathroom downstairs has a nursing room. This made my life so much easier when I needed to feed my then-infant daughter. Bathrooms have a step stool at some of the sinks. Seriously? Again, this was amazing when I had an infant and my older daughter couldn’t reach the sink yet. I just pushed down the stool with my foot and she hopped on. 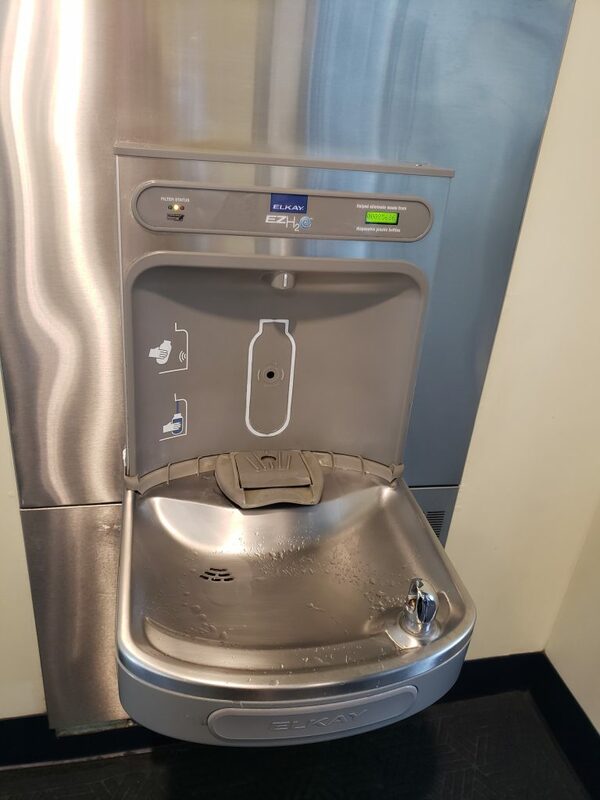 There are stations to refill water bottles. You’re kid is thirsty and will only drink out of their sippy cup? Rather not buy another water bottle? Voila! 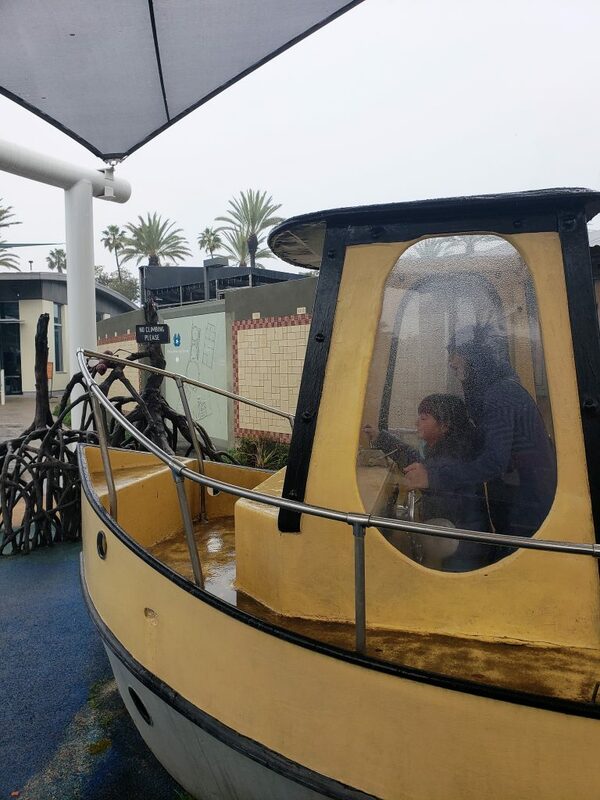 The aquarium is perfect for a rainy day activity. There is plenty to see in the indoor area. 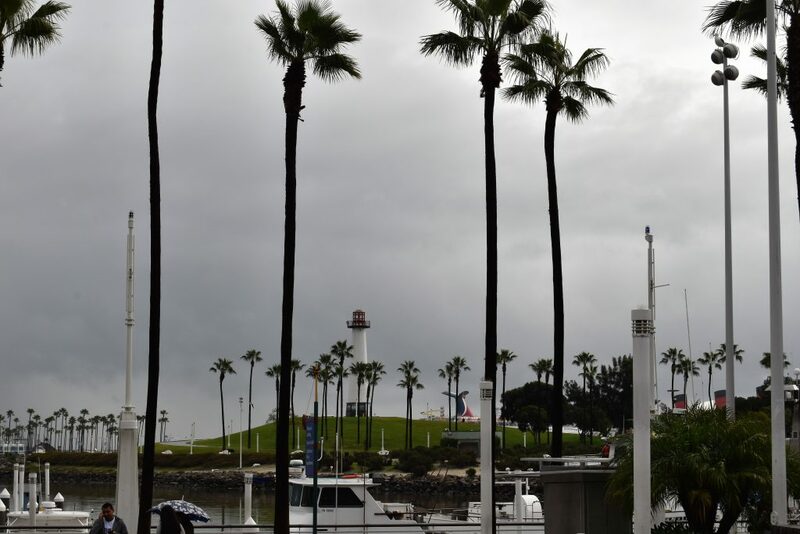 You can take a stroll in the surrounding area to enjoy the Long Beach Harbor sites and have a picnic…or grab lunch if you prefer. 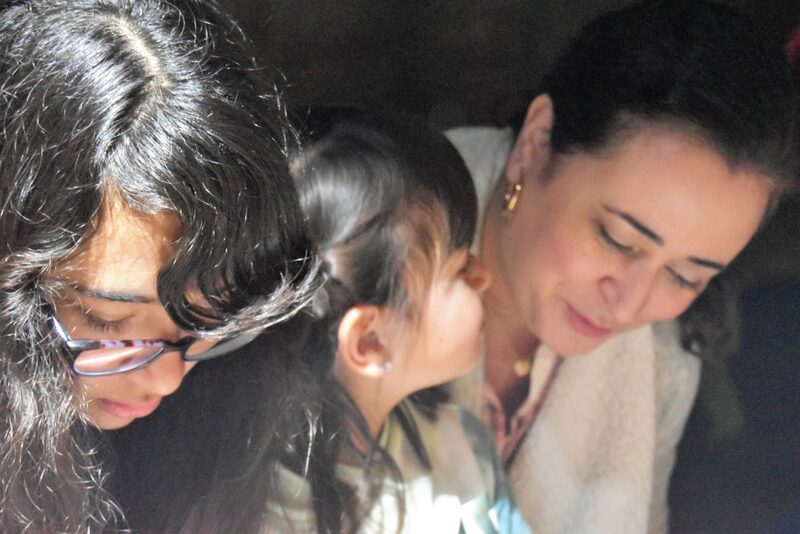 Some other reasons the Aquarium of the Pacific is a great place for moms to take their kids? Wandering free…wish I could be…part of that woooooorld! Consider the annual membership if you live close by and will want to visit again. 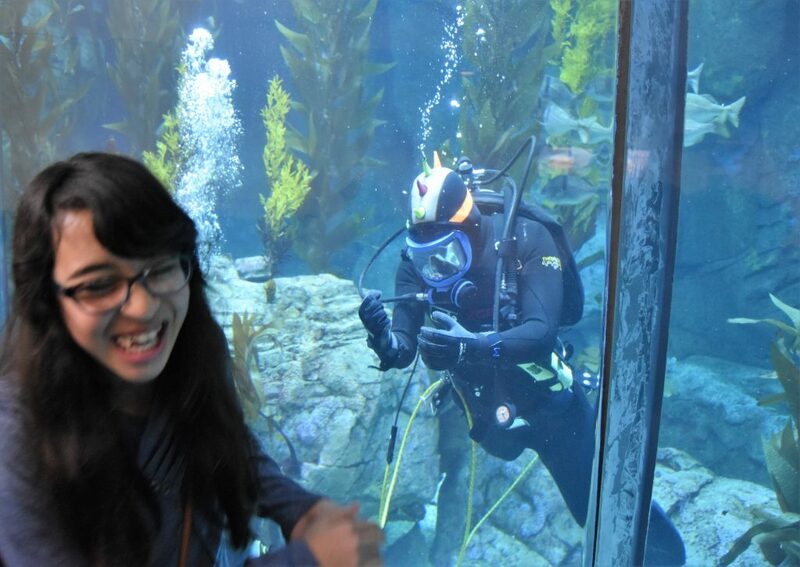 The Aquarium of the Pacific is a nonprofit organization and your membership is tax-deductable. As a member, you can also purchase discounted parking tickets. You also get a discount for purchases made in the Aquarium of the Pacific store. Double-check if you qualify for discounts (AAA, military, etc.) 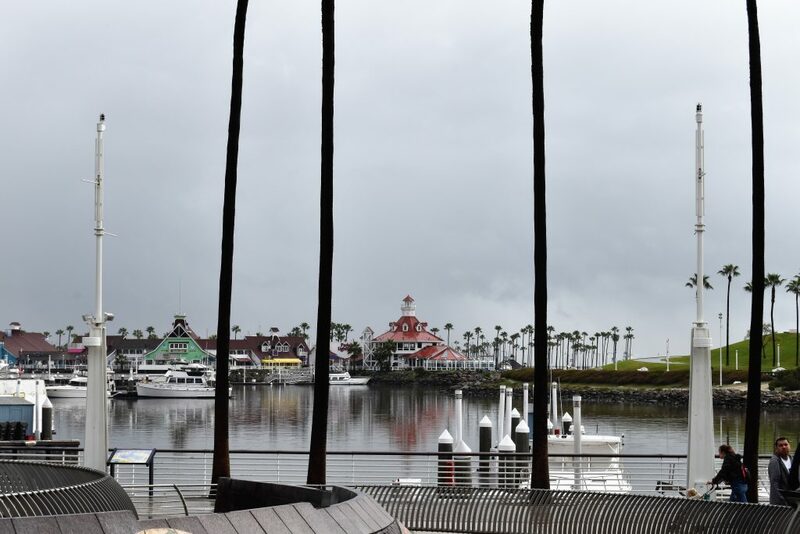 You can find tickets to the Aquarium of the Pacific on Goldstar HERE. There are various ticket combos for Aquarium of the Pacific and other local area attractions. Take a look to see if you might want one of those instead. The combo ticket information can be found HERE. Get your parking ticket validated. Cost is $8 with validation. Wear your walking shoes! There’s a lot of walking involved. Strollers are ok.
My husband caught me taking a break on a nearby bench. Go right when it opens on the weekend, or after 2pm on weekdays for less busy visit. There are a lot of school tours. Check the website for closed exhibits. 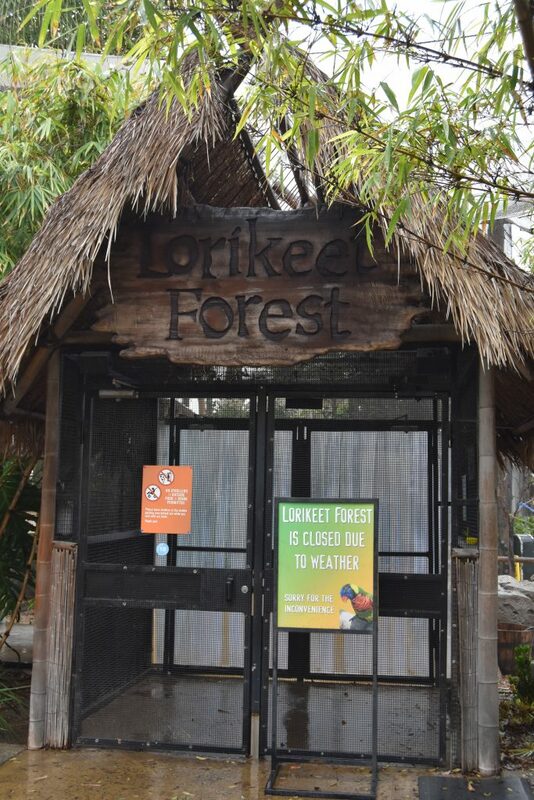 The bird enclosure was closed due to the rain. There is also some construction going on for the aquarium. However, we found that we saw pretty much everything. 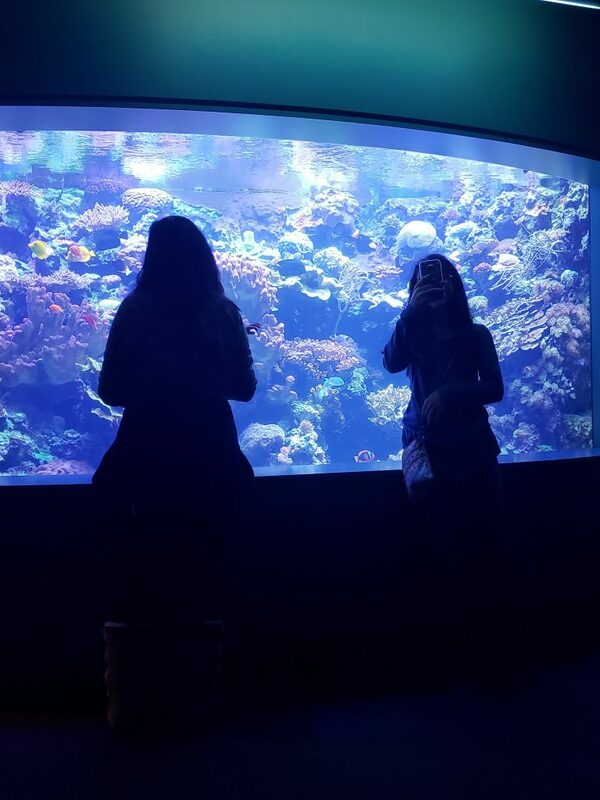 We hope that you get to the Aquarium of the Pacific and enjoy it as much as we did! CHECK OUT MORE FUN THINGS TO DO IN SOCAL!